The Daring Cooks Poach to Perfection ~ I Can Do That! They look beautiful! Congrats on such a successful challenge for this month - glad you enjoyed it! Those sausages look fabulous! I wanted to try them, but was a little too hesitant. These make me want to do it! Great job!!! These look so cool! I've never made sausages before, just 'chunks' and 'cutlets' and whatnot. These look really great. 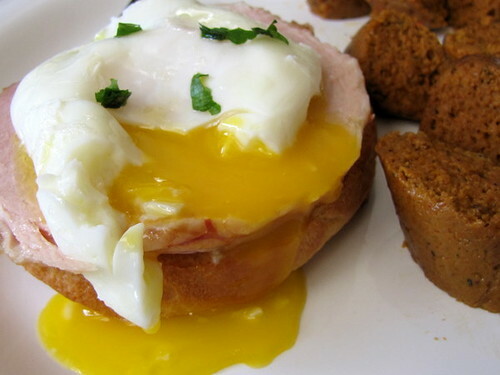 Oggim the poached egg sure look perfect, love the picture of the running yolk..so yummie! Great job on the challenge! You made both! The sausages look fantastic! I'm sure they tasted great! Congratulations! Both the eggs and sausages look amazing! 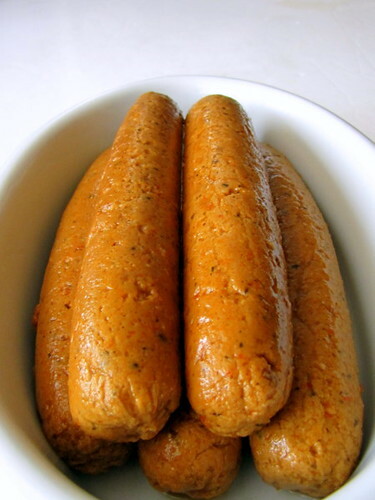 I've never made seitan sausages, but I do like vegetarian sausage a lot, so I'd like to try it soon. I can't wait to see your seitan chorizo recipe. I love how you combined the poached egg with the vegan sausages and the idea of a Spanish chorizo seitan sausages that is inspired. Lovely work on this challenge. Poached eggs are one thing I rarely ever get right, so I'm impressed with how yours turned out. That looks great. The egg is perfect.